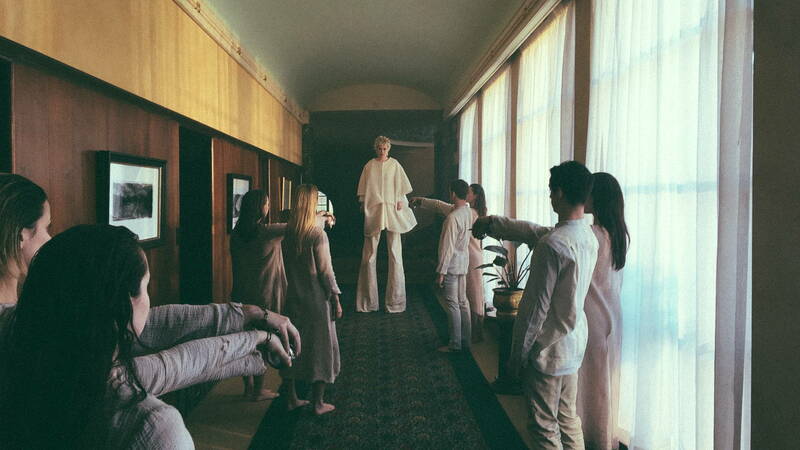 Reminiscent of Zal Batmanglij’s Sound of my Voice (one of my favourite films of 2011), Dylan Duclos’ sublime music video for West End Kids sees Australian singer-songwriter Emma Louise holding dominating court over a cult of passive teens, whose docile tedium is only broken at the behest of their towering leader, as she dictates their movements at will – reducing them to human marionettes. Marking a hat-trick of music video collaborations between himself and Emma Louise, Dylan joins DN to discuss the evolution of their creative partnership and how the film’s tone developed from its early Saw-like horror roots. What was the initial concept for West End Kids? Emma came to me with a loose idea that was probably a little too big, so I took a few aspects from it and created a new concept. from there we went back and forth and just tweaked it a little. The phrase ‘west end kids’ to me was super interesting and I guess is the backbone of the idea. I wanted to create an eerie experience – everything from the location, to the movements of actors, to the costumes and makeup had to give off a cult-like or uniformed atmosphere. The idea is that Emma is some sort of Master or Puppeteer over the 8 kids who live a dull and monotonous life inside her mansion. At any moment, she has the power to take over their bodies. The kids act as memories of Emma’s life up until this point, memories she isn’t ready to let go off, memories she wants to hold onto forever. Felicity Gleeson’s costumes have this beautiful, earthy simplicity to them, with a touch of the surreal for Emma. What references informed those style choices? Simplicity was always the intention. We wanted to create a set of costumes that were both minimal in design and colour and nothing that would clash with the production design or palette of the film. I’ve always had a surrealist approach to my work with Emma, whether that’s the idea for the clip or the costume she wears – I think it compliments her aesthetic as an artist and also her music. This was the first time I worked with Felicity, her effortless sense of style and minimalistic approach to her garments was one that I thought would suit the world we were trying to create. The oversized jacket Emma wore was actually a piece from one of Felicity’s previous collections, we discussed the intent of Emma’s character for the clip and both agreed that the jacket had this menacing quality to it, something you’d see Cruella De Vil wearing. The stilts were used to really amplify the superiority that Emma had over these kids. The cults’ orchestrated shifts from numb stillness to motion isn’t typical for music video choreography, how were those actions constructed? The choreography to me was super important as I felt like the idea behind it was imperative to portraying the narrative of the film. Maria Svarbova was a huge influence in terms of the stillness and actions of the dancers. She has such a beautiful way of creating compositions using expressionless characters. The idea behind the choreography was that when the dancers were under the thumb of Emma, their movements would be minimal and controlled – contrasted with outlandish and eccentric movements inside the golden room. The motive behind the room was that the children had escaped Emma’s ruling, they were free for that split moment to express themselves however they wanted. The story unfolds in this magnificently opulent location, how did you come to set the story there? The location was a bit of change from the initial idea but one that worked super well I thought. Originally, we were going for a really run-down and grungy look. Emma would be far scarier in a way, it was more of a Saw vibe or horror feel. However, we were fortunate enough to stumble across the used location which we all thought would create a really beautiful and powerful aesthetic. What I loved about the location was that it was a bit more high end, which I think contrasted nicely with the lifeless dancers. Emma was more of a superior person to these people, rich and classy. With each new clip we try to explore a different visual style or idea that still falls under her surrealist and hyper-stylised aesthetic. West End Kid’s eerie, dreamlike feel is further enhanced by in-camera and lighting effects. Could you share some of the techniques you and DoP Aaron McLisky used? Aaron is a great friend of mine and someone I collaborate with often across different projects. When we first chatted about the look and feel, we both agreed that it needed to have a particular warmth to it, feel surreal and dream-like and have this distinct, poetic atmosphere. We shot the entire film on steadicam and at a range of different frame rates over the course of one day on the Arri Alexa with Leica lenses, which was a real stretch but we didn’t have the budget to shoot for any longer. I think we shot 7 set ups in 12 hours which I was super stoked with. There was only one shot I shot listed that we didn’t get which I was super cool with. Aaron did a great job of lighting scenes through windows and bouncing light sources to give us the freedom of being able to freely move through space and adjust the positioning and blocking of the cast easily. For the scene where the children dance together in the room, we spoke about changing the lighting for each chorus. The first was a more traditional approach, whereas for the second chorus, we had our gaffer outside swinging the light back and forth to give us that dreamy, rolling light look. We also shot a few set-ups at a 100fps to really accentuate the moving light and the movements of the dancers. Symmetry and bold compositions were also something we strived for through out the clip. You had to bring the film in on an accelerated schedule, what impact did that have on your post process? The time frame was pretty crazy in terms of the edit. We shot on Tuesday and I actually had to shoot another clip on the Thursday so I got an editor to start compiling and assembling it for me which was awesome and then after Thursday I got stuck into it and we eventually graded on the Sunday. Tight turn arounds can be super stressful but it’s awesome once you’re in the online, far more relaxing. In the grade we really just took advantage of the lighting and the palette of the design and location. We didn’t really change the colour on any scene except for the bathroom where we went for a more greenish look. This is your third music video with Emma Louise (following Talk Baby Talk and Underflow), how did your creative partnership begin? Is there a wider significance to Emma’s motif of white which runs across the three films? Emma’s label first approached me last year, she had seen some of the previous things that I had done and thought aesthetically we were on the same page. Super grateful they got in touch, I have had an absolute blast working with her over the course of these three films, she is an awesome artist to collaborate with but most importantly she’s a great person. It’s really cool to work with someone who feels so strongly about their image and has the ability to adapt to different ideas and executions. With each new clip we try to explore a different visual style or idea that still falls under her surrealist and hyper-stylised aesthetic. The motif of the white across the three films really comes from motivation of the different characters Emma plays. We tend to dress her in white to almost neutralise her from what is going on in each of the films. There’s usually some really flamboyant and stylised components to each of the films, so finding that balance of Emma not clashing or dominating what’s happening within the frame is one of the main reasons behind the white. Will we get a fourth collaboration? What else do you have coming up? You will get a fourth collaboration! We are in the midst of mustering up an idea now, the track is great and I am really pumped about it! I just got back from shooting in Brazil which was really fun – I have a few commercial things as well as some music videos coming up that should keep me fairly busy to the end of the year! Special shout out to my Producer Morgan Taylor, she’s the bomb.